This resort in Maharashtra is situated near Kashid which is a sea village in the district of Raigad. This 4 star luxury resort sprawls over 100 acres of breath taking scenery. Nested between the rugged forest and offering the most beautiful view of the magnificent sea in all her splendour; this picturesque location is only a three hour drive from Mumbai. Admire the sunset along the shore of the beach, take long walks in the peaceful woods and lose yourself in the serenity that nature has to offer. You can also go for a dip in the resort’s swimming pools or maybe enjoy a relaxing massage as well. Rejuvenate your mind and go back home a whole new you. Located just off Chondi Naka and a mere three kilometers from the Kihim Beach; this resort in Maharashtra enables patrons to forget their worldly cares and worries and allows them to bask in an atmosphere of leisure and relaxation. The tropically landscaped gardens simply serve to beautify the location even more. The resort amenities are inclusive of a restaurant, lounge, bar, fitness center and a library. Matheran is a picturesque little hill station that is ironically located quite close to the metropolitan city of Mumbai. This resort in Maharashtra has been designed to effortlessly blend into its surroundings. Located right in the heart of the countryside; the resort itself is an amalgamation of nature and luxury. Even the ride up to the place is a beautiful whether it is up the hills via train or through the curving roads by car. Landscaped lawns, cobbled pathways and the comfiest villas with the most beautiful interior decorations are just some of the highlights of the location. This resort in Mumbai is located along the shoreline of the Arabian sea and boasts of a beach facing hotel that features modern rooms decorated tastefully. Situated only a mere 1 km away from the INS Hamla Naval Base; the rooms offer guests with garden, sea and pool views. The location is a prime one as well because you are just the right amount of distance away from the city that the vibe around you is relaxed and rejuvenating; however you are just near enough that you can reach the city quickly enough in case of emergencies. This resort in Alibaug is only an hour and a half’s journey away from Mumbai city. Guests can unwind and de-stress in the calm and cool environment; far away from the hustle and bustle of the city. Adjacent to Alibag Town at village Varsoli; this location is renowned for the peaceful beach and palm trees, locally known as Wadi. The village also boasts of good quality fish. This resort in Maharashtra, located in Igatpuri is encircled by austere mountains and is home to a whole bunch of animals and exotic birds. Being a pet friendly resort you will see a lot of guests walking in with their pets and this allows your pet to make new friends. Meet the resort’s variety of pheasants and chickens; all in all make your stay at this resort a fun-filled one. Animals have been scientifically proven to help humans cope with stress and fatigue as well as reduce the levels of their anxieties. This concept built the foundation and helped pioneer this pet friendly resort. Feast your eyes upon the setting sun as it goes down behind the strategically built Shivaji fort; just off of the coast of Murud Janjira. Enjoy this stunningly beautiful view for free as you stay at this resort in Maharashtra. Located only a few 100 kilometers south of Mumbai; this resorts serves as the ideal weekend getaway from the noise and crowds of busy city life. Watches do not serve any purpose in this scenic location as time slows down to a standstill. 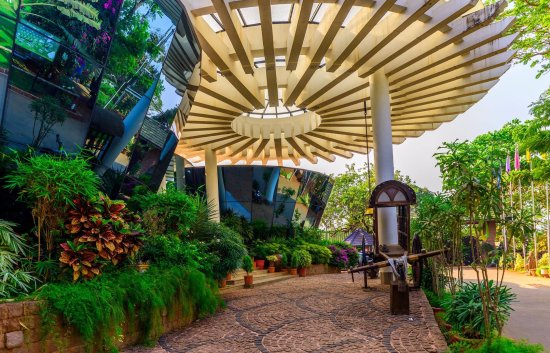 This resort in Mumbai is a beautiful rain-forest resort. Covered by more than two thousand trees (in addition to the plantation of the resort itself) the weather is always cool and pleasant here, even in summers. There are plenty of activities organized by the resort itself that will help you fully take in the beauty of your surroundings. Jungle watching (bird watching), stargazing, walks in the valley, visiting temples rich with heritage etc. are just some among the many activities that you can be a part of which will help you immerse yourself in your enchanting surroundings. Located in Mahabaleshwar, a peaceful hill station, this resort is constructed in a simple cottage type way. It really lets you enjoy the simple things in life like maybe talking a walk outside as the sun rises, spending quality time with your loved ones or partner or maybe just some much needed alone time for yourself as your mind and body rejuvenates. Situated in Karjat; this resort enables their patrons to live like kings and queens in the lap of luxury. There are plenty of beautiful places nearby that you can explore including a steep valley that will take your breath away. However; sometimes it is important for you to just enjoy and pamper yourself. Now that you’ve gone through our list; what are your weekend plans going to be?